The winter break arrived at a fantastic time for Rangers. From the league, one domestic cup competition and our Europa League run we’ve played the equivalent of a full league campaign with 38 games fitted in since 12th July with very few weeks going past without two games being played. The summer saw a heavy turnover of players both arriving and departing which had to happen to improve the squad. Nine permanent transfers came in whilst Jamie Murphy made his loan stay permanent and we brought in a further five loanees. Fourteen new arrivals in one window is quite something and generally we can’t argue with the return so far even if some have failed to live up to the standards expected. Our support can be slightly fickle with loan signings unless they are exceeding expectations and in Joe Worrall he has received heavy criticism from the support. Yet in the bigger games he has generally performed well but has been shaky in perceived lesser games and fans see him as the reason Katic has been removed from the starting XI after forming an early strong partnership with our first choice centre back Connor Goldson. Lassanna Coulibaly has went from an initial must buy to someone many would be happy if the club were to announce an early termination of his loan. Ovie Ejaria showed glimpses of promise but lacked that killer instinct or cynical nature – be that scoring, playing that defence cutting pass on a consistent basis or taking out a Celtic player on the counter and his decision to cut the loan early proved he didn’t have what it takes to be a Ranger. Ryan Kent however has been a revelation and I think Lustig is still off for that hot dog Ryan sent him in the Old Firm win. He is so comfortable on the ball in tight areas, one of a few players who are able to go beyond his man and create something out of nothing and shows a composure in the area that belies his age. He has also massively improved in the short time with us, his energy in the press and on the ball had been sorely missed through injury before making his comeback and giving Lustig nightmares. It is thought Rangers are in discussion with Liverpool over Ryan, either in extending the loan past the season with his contract expiring in summer 2020 or a permanent deal. We are lucky to have a fantastic working relationship with Liverpool and the player has indicated he is willing to discuss a more permanent move here. Umar Sadiq, well I have no words to describe that man. We're well shot of him. In terms of the permanent transfers Borna Barisic (£1.5m) and Eros Grezda (£2m) both arrived from Osijek following our win over them. This followed some crass comments from an Osijek player and manager, top sh!t-housery from the club. Barisic has been solid and gives us great balance as an attacking threat from left full back and is adept defensively but has suffered two injuries now which has curtailed his contribution. Grezda has had his own injury problems but he did have a run in the side and at times looked good in parts of his game but the end product was not always there. Gerrard has challenged him to show he is a Rangers quality player so hopefully pushes on once his injury properly clears. As touched on above, Goldson has been the standout centre half and was a colossal versus Celtic in fighting through the pain barrier but has also had some inconsistent performances too. The big man can hopefully build on an excellent Old Firm showing and he gets what it means to the support, keeping it simple will benefit his game no end. Behind him, Allan McGregor has been a standout and frankly kept us in the Europa League run as long as we did through some incredible individual displays. Suffice to say he's an upgrade on Foderingham who is by no means a poor goalkeeper. His experience in how to win titles is important but one negative would be his distribution of the ball which can be poor at times. Elsewhere in the squad, Lafferty and Flanagan have probably been let downs despite only ever coming in to bring cover to the first team, the latter has lost his way badly after a decent start to the season to the point where he is third or even fourth choice full back even if it took Gerrard a while to take that action despite the support demanding such a change earlier. Conversely, Niko Katic is someone the fans seem to really like and has to do with a strong partnership formed with Connor Goldson but he has been out of the team for a while now. Gerrard has discussed that he sees Katic as a longer term option and played him more initially out of necessity. Finally Scott Arfield has been a very shrewd free signing from Burnley and as the more attacking of the three midfielders he's been a vital link player in terms of supporting the attack whilst forming a good understanding with Alfredo Morelo. The way Arfield rattled Brown in the latest Old Firm performance showed his character and he also has six goals and four assists this season already. Steven Gerrard has done well to integrate a lot of these players in such a short period. He's not resting on his laurels though and, in January we’ve made two big loan signings in Jermain Defoe and Steven Davis: yes they are perhaps past their peak but they still bring quality and solve an issue where we create a lot in certain games without getting the 2nd or 3rd goal. This has seen us lose points late on too many times this season and hopefully in Davis and his composure on the ball and ability to see a killer pass we can cut open low block defences. Too often teams have sat in against us and we’ve found it really difficult to create clear chances despite having the ball for the majority of the game, never has an example been clearer than in the two defeats to Aberdeen this season where they literally have one chance in both games from set pieces and we somehow lost due to not being able to get in behind their block. I think I speak for every Rangers fan when I say the Europa League run was beyond what could be expected of this side at this stage. Not many sides reach the group stages from the first qualifying round where you need to progress past four opposition over two legs. The final game against Ufa where we went down to 10 then 9 men yet still progressed shows how astute tactically we are under Gerrard and Beale, with the latter having strong ideals when going down to 10 men. To reach the group stages and perform well was great to see again. Ibrox under the lights especially in the win versus Rapid was very memorable and the stadium was really rocking. We will also have taken in millions from this run which is vital if we're to maintain a domestic challenge in the longer term. With that in mind, the league is still the main competition us supporters want to focus on and we’re currently level on points with Celtic though having played a game more. We’ve got this hoodoo off our back by beating them which will be massive psychologically and with our players rested we can hopefully get back to our best pressing game which I’ve felt has been lacking recently apart from the Celtic performance. This is understandable given the amount of games we’ve played. We’ve had the least defeats in the league but have had too many draws and lost too many points in the last couple of minutes, a few stats comparing the 17/18 league season to this – we’re scoring 2.05 goals per game compared to 2 goals a game in 17/18, we’re conceding much fewer this season with 0.76 goals a game compared to 1.31 per game last season and are gaining 2 points per game this season compared to just 1.84 last season. Having said that, we’ve received far too many red cards this season – some of which I personally feel have been unfair but sometimes they've also been silly and deserved. Alfredo Morelos gets persecuted within this country and this narrative the media wish to portray of him which borders on casual racism and absolutely xenophobia means he gets away with far less than other players can. His 20 goals and all round play has been incredible and has had to carry us at times. Statistically we’re showing real signs of improvement, the fans feel a much closer link to these players, we’ve got the monkey of Celtic off our backs and laid down a marker with the captures of Davis and Defoe. Such transfers also allows us to be more flexible tactically and our Tenerife training camp should really freshen us up for a strong title challenge, even we need to show improvements from what was a generally poor December. 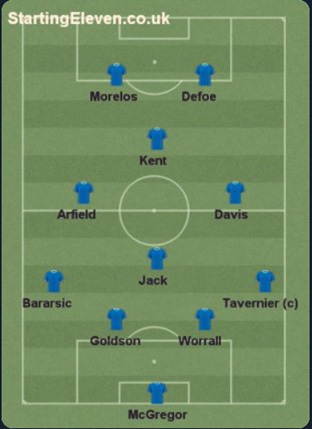 Talking about being more flexible tactically, whilst I feel 4-3-3 will remain our go-to formation I posed a question whether this side below in a 4-4-2 diamond would work on Twitter and was well received (see image below).